PCTRAN is a PC-based software specifically designed for nuclear power plant and other radiological release event’s emergency response. For power plants its scope goes beyond normal training simulators to core-melt and containment failure. For other releases the source could be either accidental from a dry or pool storage, or intentional such as a “dirty bomb”. Meteorological conditions are then input to the code for area dose dispersion. The projected dose imposed on its neighborhood map can be used for activation level determination and guidelines for protective actions. PCTRAN is designed in the Microsoft Windows-XP environment. Operation is user-friendly in standard graphical-user-interface (GUI). For a power plant, design of its nuclear steam supply system (NSSS), containment and spent fuel pool is plant specific. All essential systems and their respective controls are modeled in detail. All categories of transients and accidents in the Final Safety Analysis Report were analyzed and documented to assure general agreement. Furthermore, severe accidents conducted by the individual utility in support for its probabilistic risk assessment (PRA) Level 2 (core degradation) and Level 3 (fission product relocation) were also benchmarked for consistency. The release source term is estimated according to NUREG 1465 “Revised Source Term”. In addition to fuel gap release of iodine noble gas isotopes, fuel elements after meltdown are included. Using the Gaussian puff dispersion model, live data in wind speed, direction and stability class are allowed to vary. A typical PC’s processor can achieve all these either real-time or many times faster. Real-time is good for training or exercise. Running fast-time is advantageous for answering “what if” questions and allows projection of consequence ahead of actual hazard. Intentional release of a radiological dispersal device (RDD) for terrorist reason is commonly called “dirty bomb”. A contained source of industrial or medical isotopes is set to release either by explosive or any other mechanism. Its psychological impact could far exceed actual damage. Having a dose projection system on hand could provide quantitative estimate so as to reduce the threat intensity. PCTRAN-Puff provides the user with a table for typing in the isotope types and strength. Followed by entering the meteorological conditions, area dispersion is projected the same way as the power plant model. The difference is the background map is anywhere of concern and the release point is anywhere in the map. The current puff model is two-dimensional semi-infinite sphere with elevated release. Colored contour diagrams of thyroid, whole-body (ICRP-2) and TEDE (RG 1.183) doses (rate and integrated) are displayed in the map. PCTRAN is the only tool so far that integrates inside-plant simulation with outside-plant dose projection. It goes beyond training simulators and conventional means to cover all feasible radiological events. Having a comprehensive devise for all feasible radiological events – power plants and others – is the first step to standardize the response process. Having it implemented at a number of pilot projects, feedback from field experience should gradually advance it to general application. 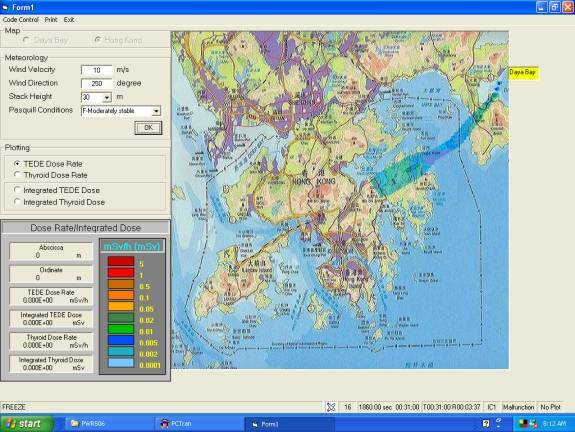 Hypothetical radiological release from Guangdong nuclear plant in Daya Bay, China plume effect to the Hong Kong territory emergency plan – Work performed for the Hong Kong Government by Micro-Simulation Technology of USA.